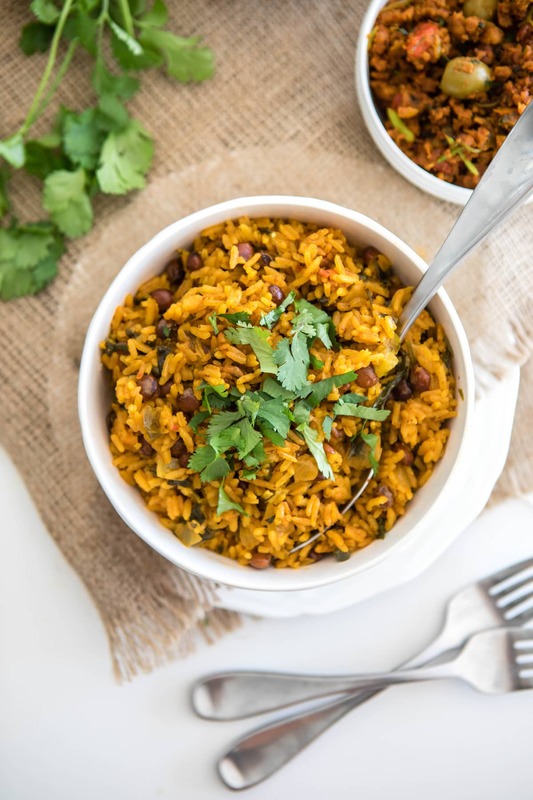 Creamy, hearty, and flavorful, this Vegan Arroz con Guandules is a classic Puerto Rican dish. Perfect as a side, but also delicious enough for a main! 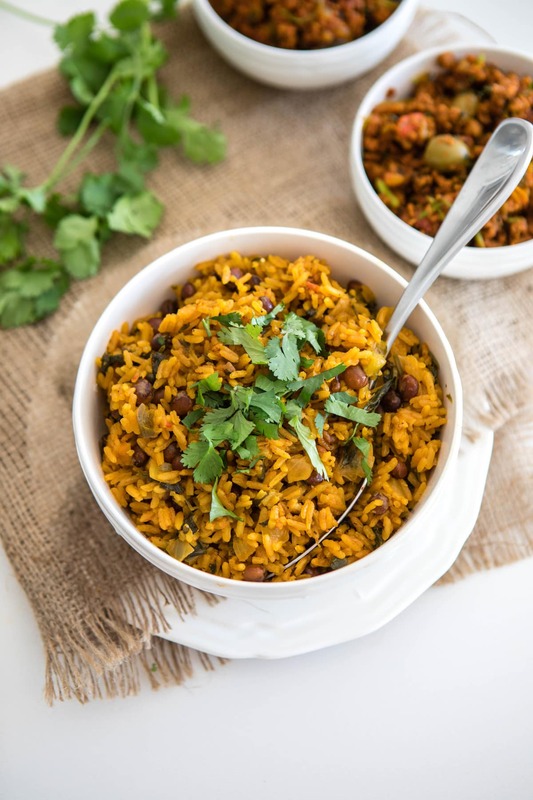 Arroz con Guandules is a classic Puerto Rican or Dominican recipe. 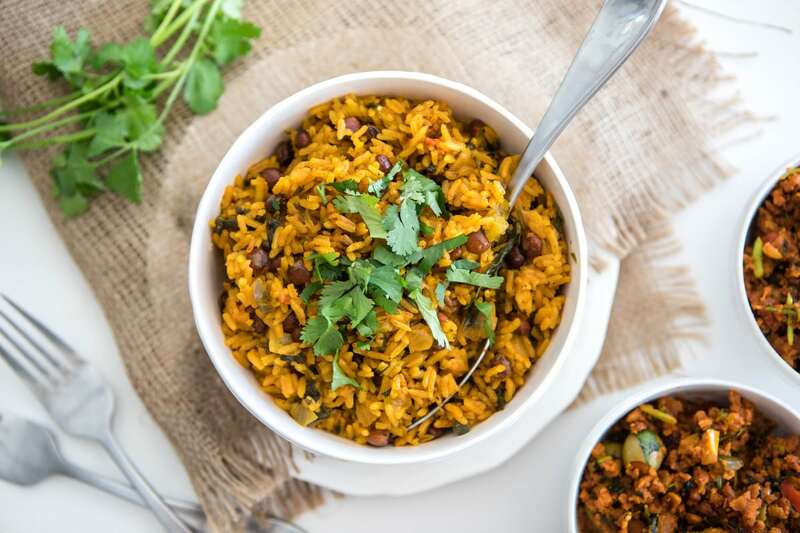 The “Arroz” refers to the fluffy, fragrant rice, while “Guandules” are Pigeon Peas, a common legume found in Latin American cuisine. This recipe is not just plain ol’ Rice and Beans, though. 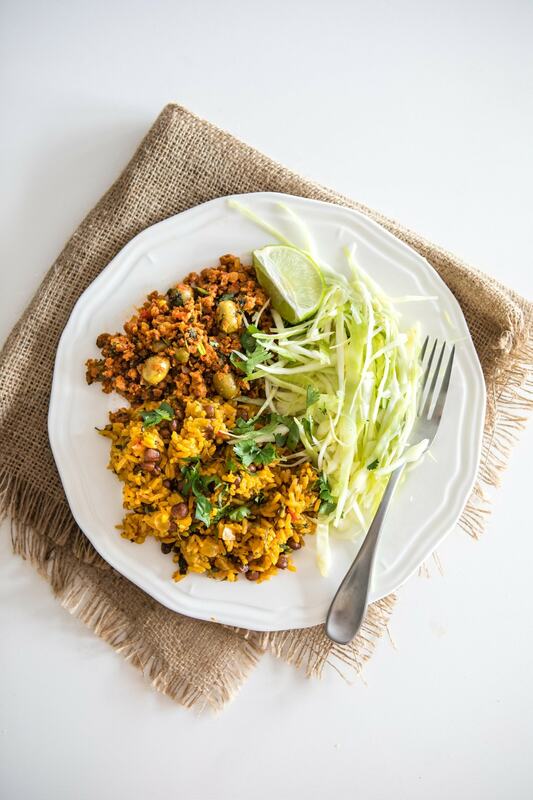 It’s bursting with flavor and creaminess, thanks to lots of Spices, Coconut Milk, Cilantro, and Veggies. This recipe actually comes from my dear friend, Coco. 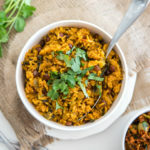 Arroz con Guandules was a classic childhood dish for her, and she was determined to veganize it after she made the switch to a plant-based lifestyle. This version has now become a staple in her diet, and all of her non-vegan friends and family rave about it as well 🙂 It’s that delicious! (Seriously). 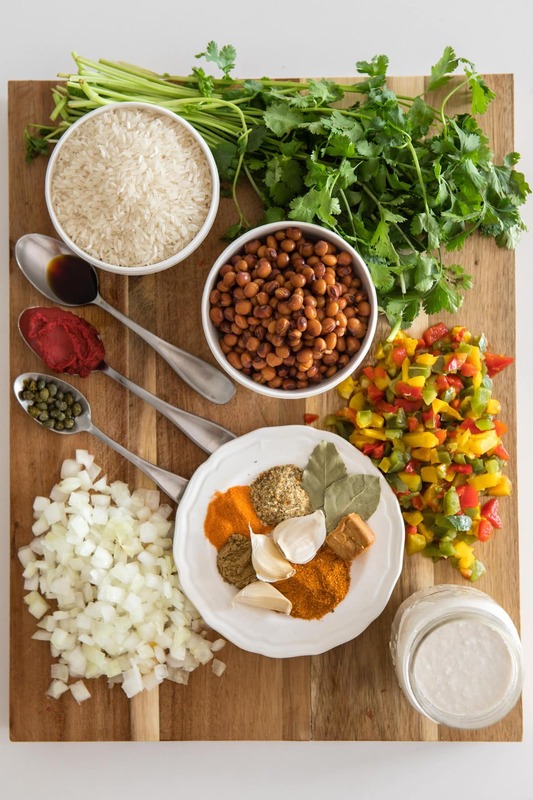 Coco also showed me how to make some Vegan Picadillo for my #FromYourBowl blog series. Be sure to check that out after you finish reading this post! This dish has a few key steps, but each serves an important purpose and adds a key layer of flavor. First, we’ll make the Sofrito – which is the Puerto Rican term for a combination of sautéed Peppers, Onions, Garlic, and Tomatoes. Once that’s simmering away, we’ll add in some Spices, Capers, and Coconut Milk. Bring that to a simmer, add in your Rice, and you’re good to go! Well…kind of 😉 This recipe is definitely one of those “taste as you go” ones, and the more Spices you add, the better! Coco also told me that it’s very important to add Cilantro at multiple points during the cooking process for maximum flavor. 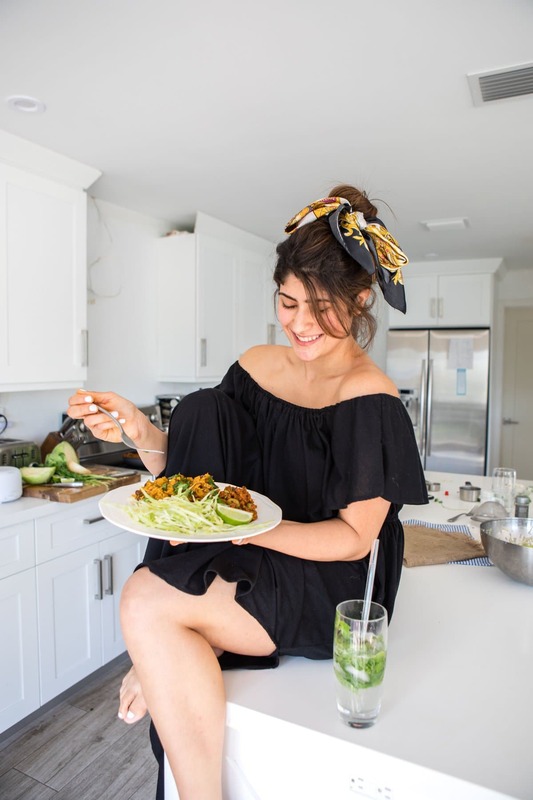 I’ve included a few other of her tips and tricks in the recipe notes for this blog post – be sure to read it thoroughly before you start. This Arroz con Guandules can be served as a side dish, but it’s honestly tasty and hearty enough to serve as a main. This recipe makes a large batch too, so it’s great for large family dinners or Meal Prep! Use a wooden spoon to cook everything; plastic and metal affect the final flavor of the dish! It’s also important to rinse your Rice only just before adding it to the pot; if you do it too far in advance the grains have a tendency to break while simmering. 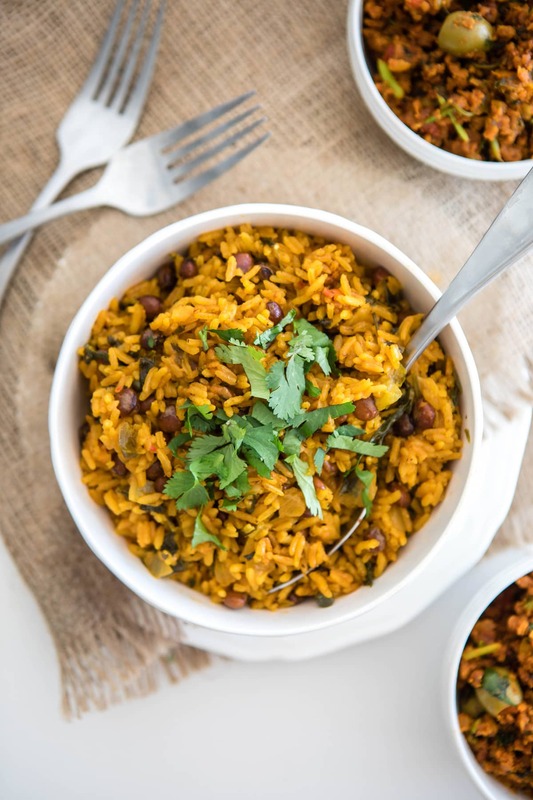 Want something to serve alongside this Arroz con Guandules? I’d highly recommend this Vegan Picadillo. And if you’re looking for more hearty recipes using Rice, you’ll also love this Cheesy Broccoli Rice Casserole and this Instant Pot Rice & Beans! First, add the cooking oil to a medium pot and raise to medium-high heat. Add the Onion, diced Bell Peppers, ½ of the bunch of chopped Cilantro, Bay Leaves, and Garlic to the pot. Sauté until the Onions are translucent, about 3-5 minutes. 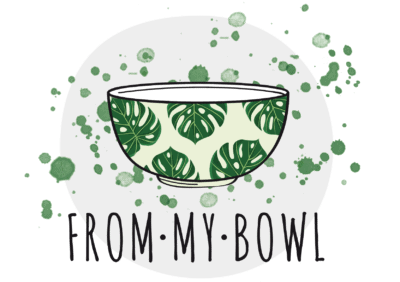 Use a wooden spoon to cook everything; plastic and metal affect the final flavor of the dish! Add the Vegan Chicken-Flavored Bouillon and Tomato Paste to the pot and use the spoon to “mash” them into the Vegetables. Sauté for an additional 2-3 minutes. Then, add the Capers, entire can of Guandules Secos, Tamari, Cumin, and Sazon con Azafran. Sauté until the spices are fragrant and evenly distributed, about 3 minutes. Add ½ of the remaining Cilantro to the pot along with the can of Coconut Milk and remaining spices, then bring everything to a simmer over high heat. Rinse the Rice under cold water, then immediately add it to the simmering mixture. Once a few grains of rice start to float to the top of the mixture, add the rest of the Cilantro, mix well, and cover. Reduce the heat to low and let simmer for 20 minutes. Fluff with a fork, serve, and enjoy! Leftovers will keep in the fridge for up to 5 days. You should be able to find the Sazon Tropical and Sazon con Azafran in the Hispanic food section of most grocery stores, but you can also purchase them online. Vegan Picadillo Recipe | Easy + Flavorful! This looks so yummy!! If I may, Pigeon Peas in spanish is spelled GANDULES. Going to try this recipe tomorrow. Thank you for posting it. Coco looks so lovely and happy with her arroz con guandales! I have never tried pigeon peas before. However, I most certainly would love to because if they complement rice, I know I’d enjoy them! @Jess, when the water starts to evaporate and it s at the same level as the rice (or slightly below) you cover it and put it on the lowest setting. Do not open the lid. The steam is what finishes the cooking. If you find it is still not done, leave the lid on another 5 minutes with the flame off. Glad you can please your Dominican MIL! My cousin who is a great cook and grew up in PR taught me how to make her arroz con gandules. Love it! Sazon con Azafran has MSG as it’s first ingredient 🙁 Do you know of any healthier subs for that spice mix? Thanks! I don’t I’m sorry! Perhaps there is a MSG-free variety out there online?